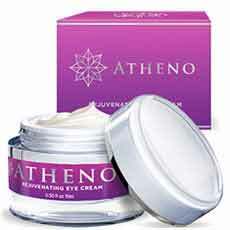 Atheno Cream is a skin care product that is designed to eliminate aging skin around the eye. When the formula is added to your regimen, it provides the needed hydration to your body efficiently. It is composed of natural compounds that are claimed to remove aging marks and rebuild sagging skin. The cream has the ability to stimulate the skin to produce collagen and elastin that promote skin firmness, suppleness and improve skin structure while delaying aging signs that affect the thin skin around the eye. In addition, it is also capable of clearing wrinkles and fine lines. It is also suitable for both normal and sensitive skin. The manufacturer of the Atheno Cream claims several benefits to the user. When you add this cream in your regimen it has the ability to stimulate collagen production and elastin that supports skin rejuvenation. This helps to eliminate fine lines from your eye circles. It also removes dark circles to help tone your skin. The cream also claims to hold moisture water that aid in hydrating your skin. With Atheno Cream expect your skin to be free from skin conditions like acne skin dryness among others. Atheno Cream works to eliminate all visible signs of aging. When the formula is applied, it affects the skin cells that naturally produce the collagen that rejuvenate the skin. Therefore, it stimulates the skin to produce collagen and elastin. Collagen aid the skin to trap water while revitalizing and rejuvenating your skin. Vitamin C– It plays an important role in anti-aging skincare. It helps in clearing dark spots that are caused by sunburn, brightens the look of the skin as well as toning the skin. Peptides– They are proteins that increase the amount of elastin and collagen that supple the skin, firm it and makes it health.it makes the skin radiant by giving it a soft and smooth feel. No cons associated with the products. How Does Atheno Cream Work? The cream works to repair the dead skin cells, increase moisture retention as well as rejuvenating and replenishing your skin. It stimulate elastin and collagen formation that enhance skin suppleness and firms it. The collagen also aids in water retention resulting to skin hydration. It also promote elimination of dark spots and blemishes around the eyes. For How Long Should I Use Atheno Cream? You only need to apply this cream regimen for several weeks for you to achieve the expected results. Note that you need to be consistent in as directed by a dermatologist for two months for you to have the claimed results. Atheno Cream is a skin care product that is designed to assist you to eliminate signs of aging around your eyes. The cream is well suited in supporting collagen and elastin that help to renew your aging skin. It helps to hold water in your skin cells that moisturize your skin all through. In addition, it assists to clear black spots and blemishes that are caused by sunburns. It is also applied on any skin type, therefore you can use it for both normal and sensitive skin. However, it is good to carry a research on this product to get into deeper details while consulting a dermatologist. This will help you get insight before making any decision of using it. It is good to note that each formula relates differently depending on your body skin system.Also, make a comparison with other anti-aging formula on the market and go for what suits your needs.